Should be seeing a Press Release about the Holiday Train soon. Last year, the train debuted on Friday, 11/29/13(day after Thanksgiving). 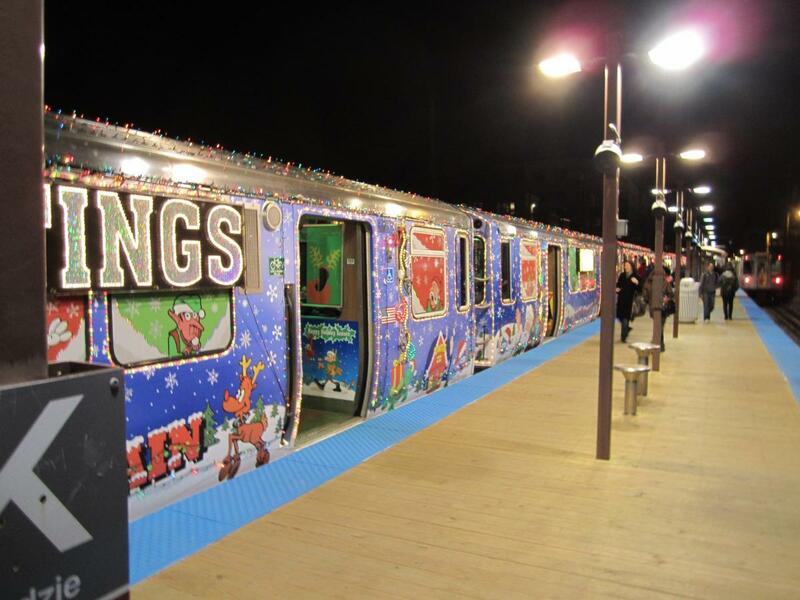 It should do the same thing this year, so 11/28/14 will be the debut of the "Santa's Express" 'L' Train. 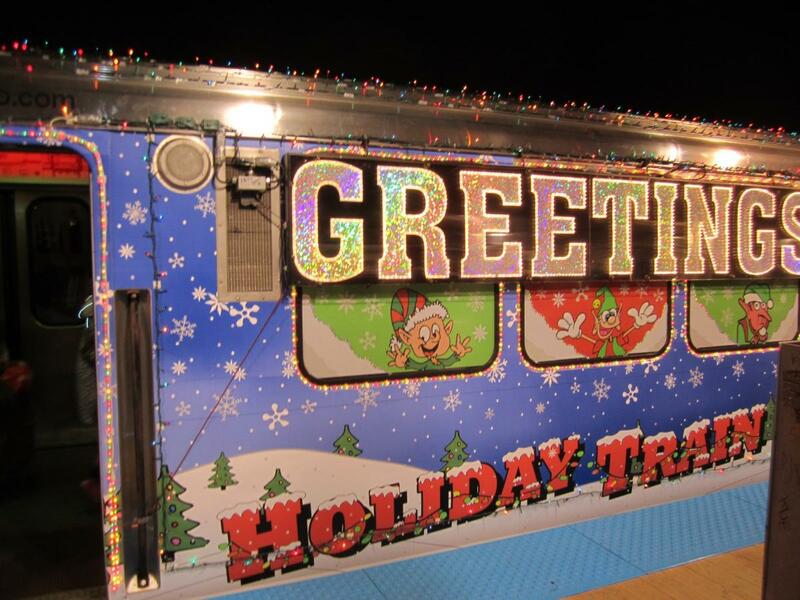 Countdown To The Ho-Ho-Holiday Train 2014: 1 Day!!! Okay, wrong thread... that would be the new Holiday Bus. 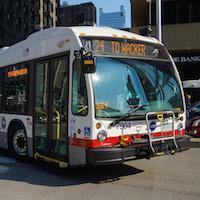 Official Facebook announcement by the CTA. Kevin has the train info above. 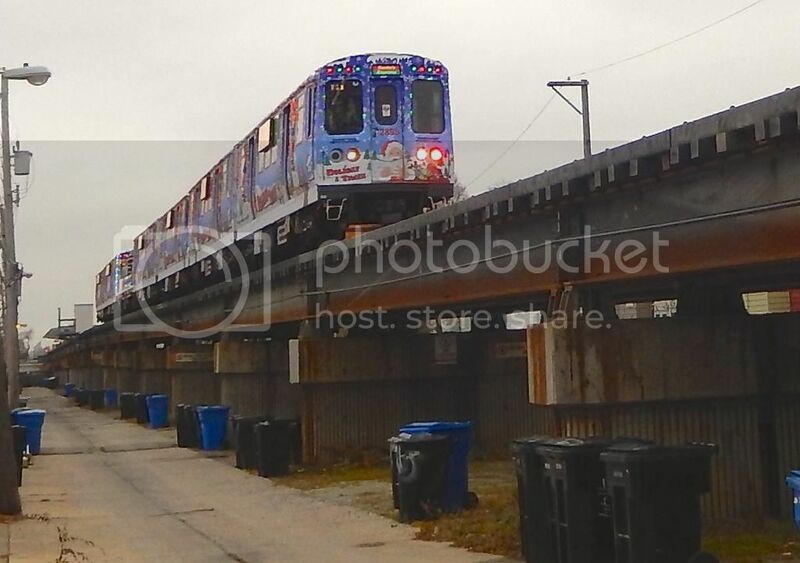 All Holiday Train runs from the Green Line will pull-out/pull-in from the Midway Yard. This began in 2012 and has been the practice since then. 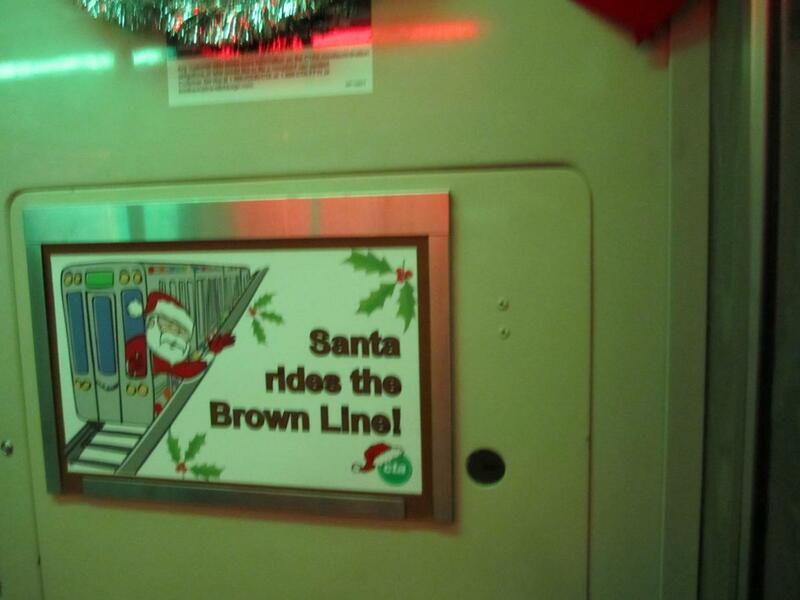 Green Line Holiday Runs used to originate from the Linden Yard (hence there aren't anymore merged Green/Purple Line Express runs during the Green Line's operation of the Holiday Train). This is due to security, so that holiday train you saw this afternoon going southbound is laying up at the Midway Yard. Just saw it about to end its maiden voyage on the Orange/Green Lines. Saw it from a distance at Oak Park. I noticed lights on the windshield in-between the 2nd and the 3rd cars. That should count for a new change. Who doesn't like the Holiday Train? Everyone in Chicago seems to!!! 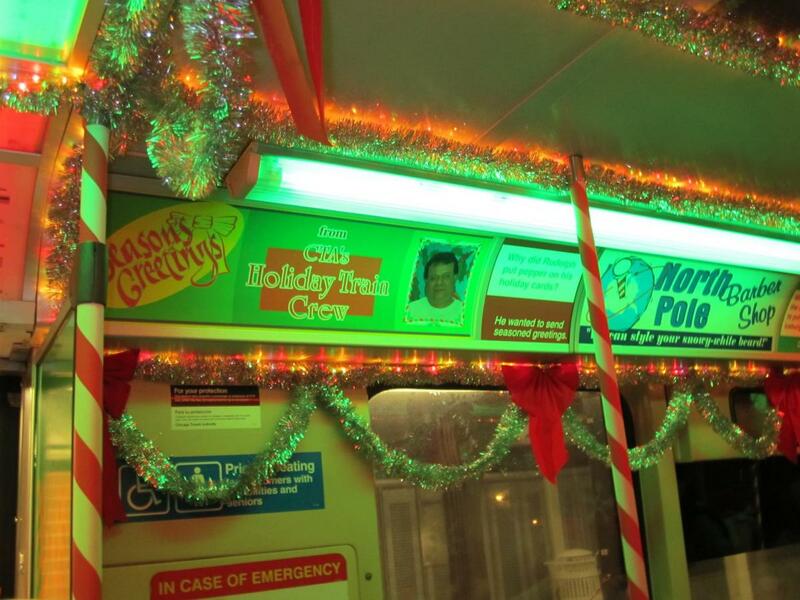 Unless they are all on 30-day passes, CTA must be making some money on this, as well as collecting food for the needy. Especially if the Green Line is that packed. New schedules are going up, now for the Brown & Orange Lines!!! Just saw the holiday train at Roosevelt and State. Very cool! 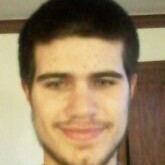 I hate I was in my car so I couldn't get pics. I was at Midway for the Holiday Train and it looked cool! But I didn't like the fact that it started from Kimball. Midway was WAY crowded and they had people waiting outside of the doors in the cold. 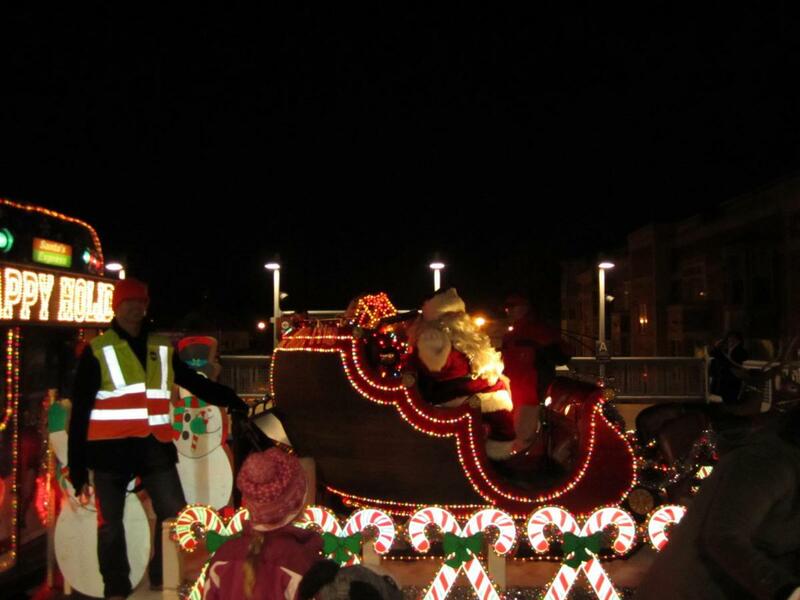 They had 2897-2898 completely outside of the station to get Santa's flatbed away from the stairs. Also, when on the train, there was no elbow room at all. It was way over crowded and I think these problems would've been resolved if the train originated from Midway like it has in the past years. Overall, I thought the train was cool, just too crowded from Midway to Roosevelt (I got off at Roosevelt). 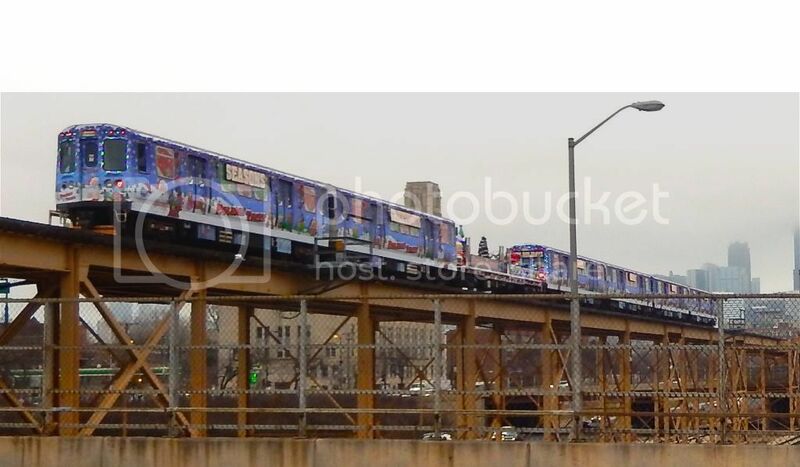 Also, if the train looks very familiar, it's because its the same decal wrap from the 2013 Holiday Train, so there will be a difficult time in the future to tell the difference between the 2013 and 2014 Holiday Train's because of the decal scheme. I think they left 2893-2898 at Skokie Shops over the winter of 2013- winter of 2014... But I could be wrong. I actually did both for two different years. I rode the Brown-Orange Line combo on a Saturday, and I rode the Pink Line run on a weekday. Both were very pleasant rides. The trick for the Saturday run is to board at Kimball, and if you have no business with Santa, just make a dash for the train car you want. For the Pink Line, there weren't many people to begin with, so I instantly got the "railfan" seat. It was dead heading this evening through the Dearborn Subway en route to Rosemont. Here it come's, the Grand Finale on the "Money Route's". 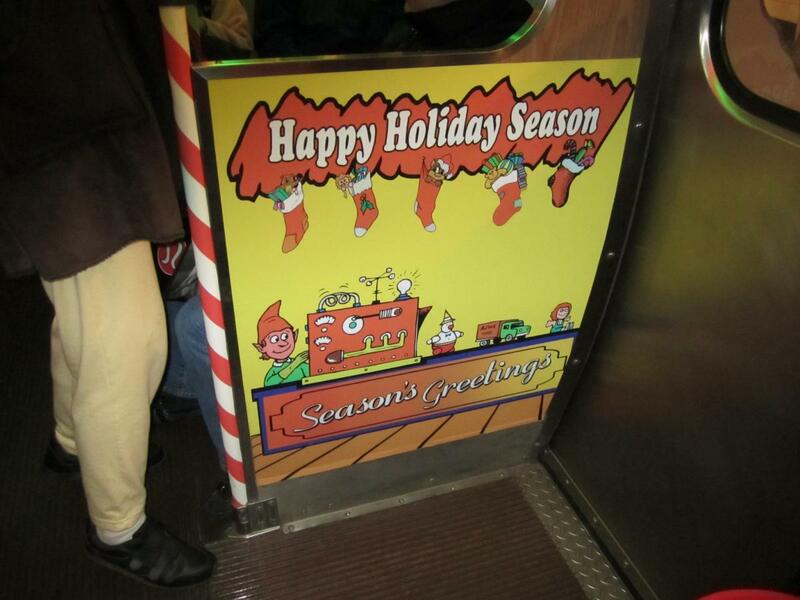 Today was the last day to getting that "comfortable" ride on the Holiday Train on the Pink Line. With less of two weeks to go, here's some shots of this years trips. 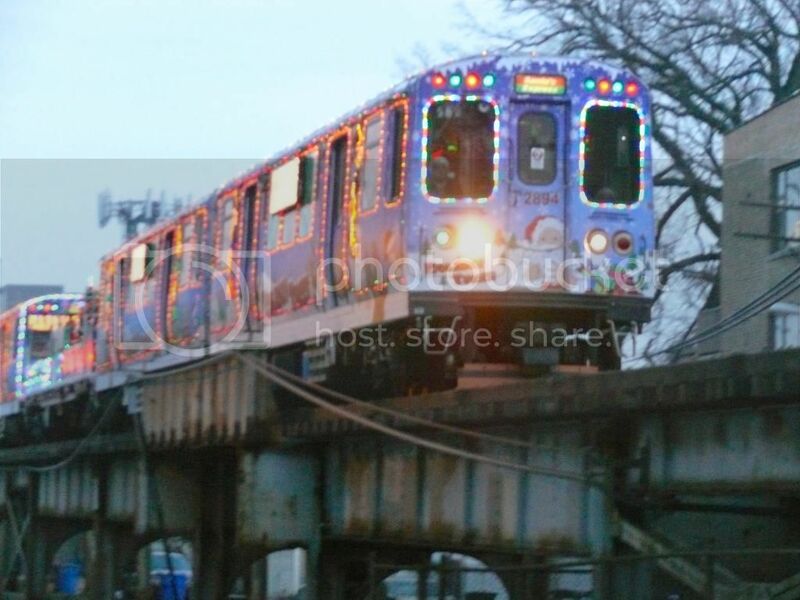 The Holiday Train on a deadhead trip from 54th to Forest Park on the incline between the Pink and the Blue lines. 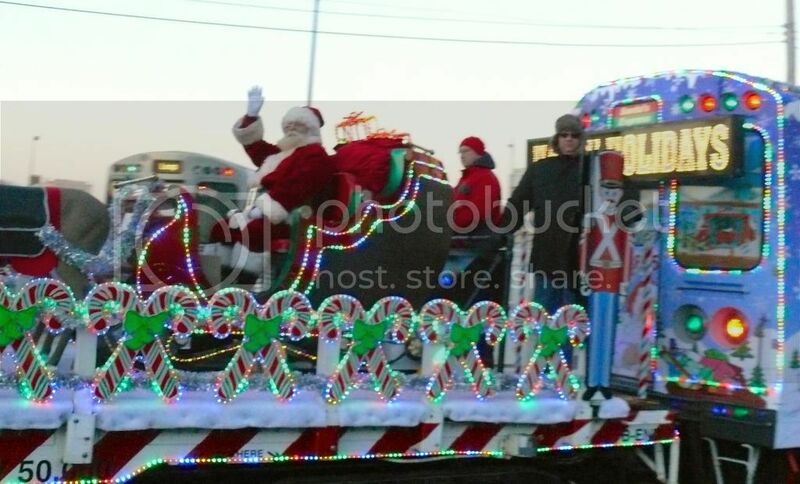 The "Man" himself aboard the flat car as the Holiday Train runs into yard at the Brown line Kimball terminal. 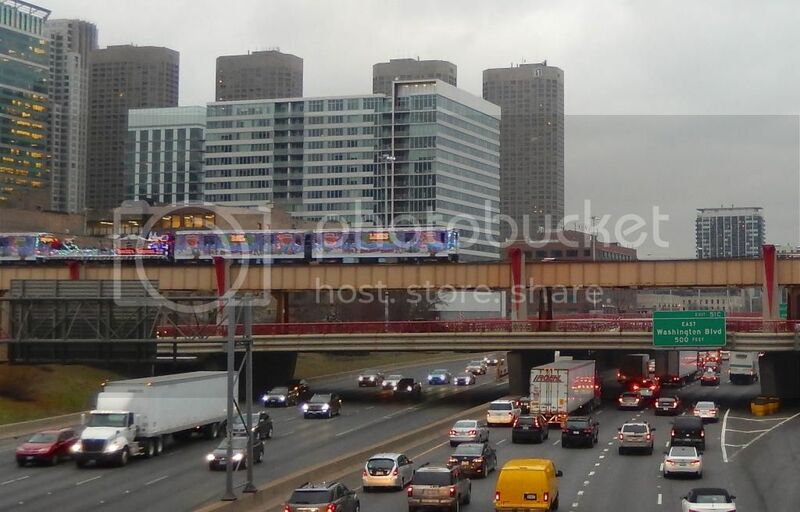 Motorist catch a friendly wave from Santa himself as the CTA Holiday Train streaks over Interstate 90- 94, the Kennedy Expressway. Four out of eight CTA lines feature surface operations including the Brown line which is entirely within the city. Here the Holiday Train, Santa, and the six cars descend. Santa, the six cars descend to the ground on the Pink line. I'm pretty sure Santa was nervous about climbing that Congress incline.